Sunday is dominated by lunar aspects. 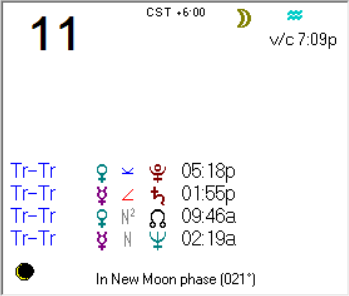 The moon is void of course in Capricorn starting 11:40 AM CST in North America, and moves into Aquarius 2:23 PM CST. We feel the shift, and this is an (another) alert that we need to focus on, and complete, Capricorn tasks soon. Aquarius brings us glimpses of the future, and you will likely see one today or Monday. And, if you did enter into an “age gap” relationship over the weekend, Sunday afternoon and Monday will bring you a glimpse into whether or not this relationship can persist.